AL GORE AT AGU! Arrive early or use the overflow room. 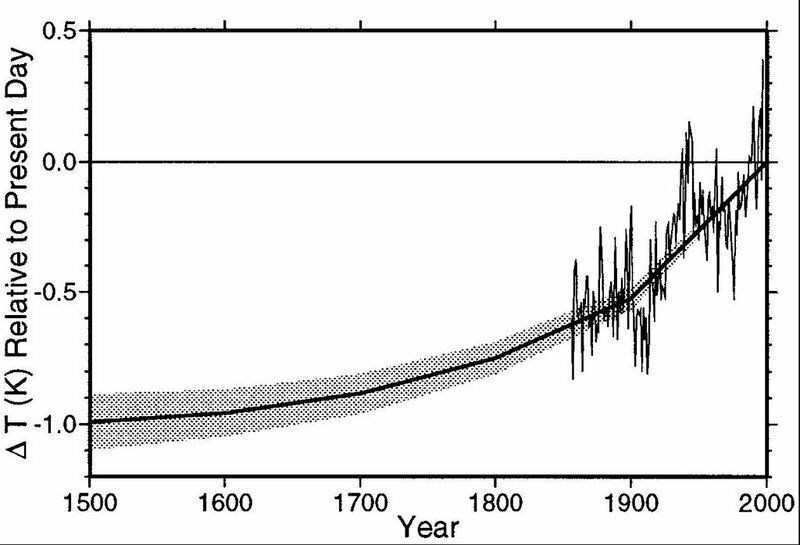 How much of current warming is due to natural causes and how much is manmade? 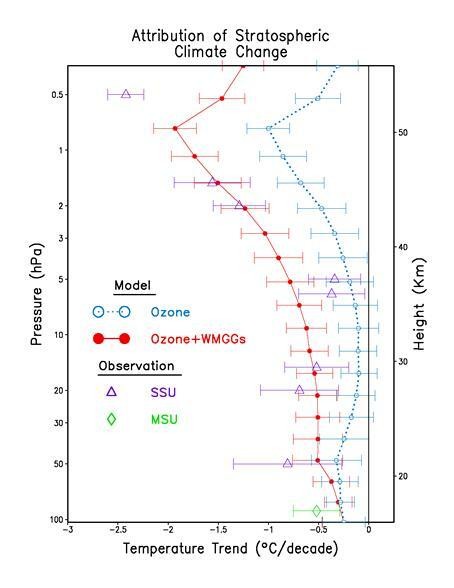 This requires a comparison of the patterns of observed warming with the best available models that incorporate both anthropogenic (greenhouse gases and aerosols) as well as natural climate forcings (solar and volcanic). Fortunately, we have the just published U.S.-Climate Change Science Program (CCSP) report, based on best current information. As seen in Fig. 1.3F of the report, modeled surface temperature trends change little with latitude, except for a stronger warming in the Arctic. The observations, however, show a strong surface warming in the northern hemisphere but not in the southern hemisphere (see Fig. 3.5C and 3.6D). The Antarctic is found to be cooling and Arctic temperatures, while currently rising, were higher in the 1930s than today. Although the Executive Summary of the CCSP report claims "clear evidence" for anthropogenic warming, based on comparing tropospheric and surface temperature trends, the report itself does not confirm this. Greenhouse models indicate that the tropics should provide the most sensitive location for their validation; trends there should increase by 200-300 percent with altitude, peaking at around 10 kilometers. 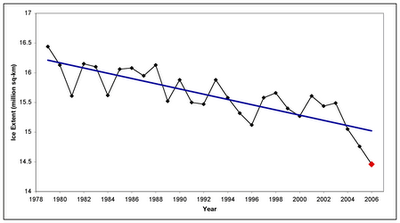 The observations, however, show the opposite: flat or even decreasing tropospheric trend values (see Fig. 3.7 and also Fig. 5.7E). This disparity is demonstrated most strikingly in Fig. 5.4G, which shows the difference between surface and troposphere trends for a collection of models (displayed as a histogram) and for balloon and satellite data. [The disparities are less apparent in the Summary, which displays model results in terms of "range" rather than as histograms.] There may be several possible reasons for the disparity: Instrumental and other effects that exaggerate or otherwise distort observed temperature trends. Or, more likely: Shortcomings in models that result in much reduced values of climate sensitivity; for example, the neglect of important negative feedbacks. Allowing for uncertainties in the data and for imperfect models, there is only one valid conclusion from the failure of greenhouse models to explain the observations: The human contribution to global warming is still quite small, so that natural climate factors are dominant. This may also explain why the climate was cooling from 1940 to 1975 -- even as greenhouse-gas levels increased rapidly. An overall test for climate prediction may soon be possible by measuring the ongoing rise in sea level. 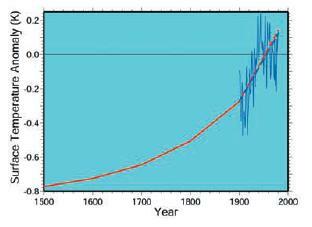 According to my estimates, sea level should rise by 1.5 to 2.0 cm per decade (about the same rate as in past millennia); the U.N.-IPCC (4th Assessment Report) predicts 1.4 to 4.3 cm per decade. In the New York Review of Books (July 13, 2006), however, James Hansen suggests 20 feet or more per century -- equivalent to about 60 cm or more per decade. Now, other than the fact that Google turns up a mess of Singer/Michaels pronuncimientos about climate change and disasters, we here at the Rabettorium were under the impression that the good Prof. Pielke runs a SCIENCE POLICY INSTITUTE and is always telling us that he loves science policy and we don't. S. Fred and Pat have been playing in the science policy patch like forever, and maybe before. I am morally certain that RPJr has never, ever read a single word of that stuff. On the other hand, I am a bunny, and you know about the morals of hares. In the words of Dorothy Parker about a particularly childish children's book, Tonstant Weader Fwowed up. But may it be that this is all a bad dream? I will stand accused of being as wistful as the boy who cried out, "Joe, say it ain't so!" to the fallen Shoeless Joe Jackson of the 1919 Chicago Black Sox, yet I maintain the hope that NASA's dismissal of "home planet" is not a case of either shooting the messenger or a too-small growth of the total NASA budget, but simply an error of transcription. Those who have labored in the humid, murky environs of Washington are aware of the unappetizing forms of life that abound there. Perhaps the NASA playbook was left open late one day, and by chance the line "to understand and protect our home planet" was erased by the slimy belly of a slug crawling in the night. For the sake of our children and grandchildren, let us pray that this is the true explanation for the devious loss, and that our home planet's rightful place in NASA's mission will be restored. When the administration announced its planned fiscal 2007 budget,NASA science was listed as having typical changes of 1 percent or so. However, Earth Science research actually had a staggering reduction of about 20 percent from the 2006 budget. How could that be accomplished? Simple enough: reduce the 2006 research budget retroactively by 20 percent! One-third of the way into fiscal year 2006, NASA Earth Science was told to go figure out how to live with a 20-percent loss of the current year’s funds. Hansen is quite the optimist. Last I heard they are going to close the library at Goddard and the grass looks pretty long and inviting. Me and my pals are going over for a snack tomorrow. Oh yeah, Hansen rips Michaels some new ones. Before the US election the dour bunny was of the opinion that at a minimum Columbia University was about to receive a gift of GISS. Whether it would be silly enough to accept the donation was another story. Goddard, Langley, JPL, Ames and Glenn were in deep trouble too, as was the entire agency. In one scenario aeronautics would go to the FAA leaving a rump Confederate Space Exploration Agency centered around Johnson, Kennedy, Marshall and Stennis. Kennedy would be renamed Strom Thurmond Space Center. The recent election has shuffled the deck. California (Ames and JPL) has Nancy Pelosi and Boxer and Feinstein who are not about to let anyone mess with their Centers, GISS is in New York with two rather powerful senators, but the big winner is Goddard. The main center is in Steny Hoyer's district (new majority leader in the House of Representatives) and Barbara Mikulski in the Senate. She will be the new chair of the subcommittee responsible for NASA appropriations. Outlying labs such as GISS and IV&V (Robert Byrd, Jay Rockerfeller and Allan Mollohan in the House) look to be in good shape. The other Centers (including Johnson, with Bush in the White House and Sheila Jackson Lee in the House, there is an odd couple) appear ok too. NASA may survive. Of course, given the talent displayed by the incumbent we have our questions about the owner operators. NASA improves security by providing spacebased resources for monitoring and detection that create a cleaner, healthier, safer world. NASA explores new worlds to improve our own. We are sending humans into space on a quest of exploration and scientific discovery. As we go, we are trailblazing the way for new commercial markets in space and economic growth at home. From space we monitor weather, climate and environmental systems on Earth so we will have a cleaner, healthier, safer world. In short, we are building a future of hope, prosperity and peace through the exploration and settlement of space, the new human frontier. C'est la meme chose. Why do I keep saying that? Followed by a rather complete list of budget issues, the last of which may be of interest to the George Deutsch/Jim Hansen fans out there. After all who will be left to rewrite Hansen's speeches if these cuts are made? The Senate Report limits funding for NASA's Office of Strategic Communications to $20M, stating that this represents adequate resources to execute the functions of the Office of Strategic Communications. It also notes that "over time, this office has grown to a total staffing level of 131 FTEs." The Office of Strategic Communications includes the Offices of Public Affairs, External Relations, Legislative Affairs, Education and Communications Planning, all of which respond to statutory direction in the Space Act. Total staffing level is on a downward path to reach 150 FTEs by the end of FY 2007,, down significantly from 198 FTEs in FY 2005. The Senate reduction of 25 percent would severely impede the Agency's ability to communicate NASA's message externally, would reduce public outreach, and would eliminate funding for all planned procurements and travel. These expenditures include the operation of NASA TV, foreign language interpreters, export control compliance programs, management of foreign visits, visa processing, health insurance for NASA personnel deployed to the former Soviet Union in conjunction with U.S. international cooperation (standard U.S. health insurance programs are insufficient for use in the FSU), and funding for audio visual equipment, much of which is necessary to support continued updates of the NASA web pages, which has been largely outsourced. Avoiding economics, one of the places where critics of the Stern report are ..... ummm... unsatisfied is the high probability of catastrophic change that is assumed. The roots of this go back to the position paper by Arnell commissioned by Stern. Unfortunately this too has very cursory discussions of the probability of such events being more concerned with their consequences (awful as you might imagine). Two possible catastrophes are considered, collapse of the thermohaline circulation and rapid global temperature rise driven by whatever (for example large releases of methane). As Arnell notes, almost all modeling considers collapse of the thermohaline circulation as improbable although a slowdown may occur. Arnell points to two modeling studies which hold that collapse has a significant probability, one by Schlesinginger, et al (Yohe being one of the al) and the other by Challenor, et al. , both from the conference on Avoiding Dangerous Climate Change. The third strand in Arnell's argument is a survey of experts where the panel was all over the place (mostly at the exits), but whose results were spread all over the spectrum. Both of the modelling papers were very careful to say that the models they used were too simple, and that the results could be overturned by more detailed calculations. So where does that leave us who know it all? Well, probably at the point where we begin to think that those who know there is no risk of catastrophic climate change don't know it all, but not convinced. A Scotch verdict (not proven) is probably the right judgement, but this is of no real help right now. A better question might be how much insurance should we take out. This is a shallow book on deep matters, about which the author knows next to nothing. This paper fills a much needed gap in the literature. The book is wretched; there is no group of readers, young or old, lay or professional, to whom I would care to recommend it. Nonetheless, there are several encomiums on the dust-jacket: from Edward Witten, the dean of string theorists, and from a number of authors of what appear to be popularizations of mathematics. They are all of the contrary opinion; they find that it is “written with grace and charm”, “readable and entertaining”, and so on. Perhaps the book is a hoax, written to expose the vanity of physicists, the fatuity of vulgarizers, the illiteracy of publishers, and the pedantry of at least one priggish mathematician. Would that this were so, for it is certainly thoroughly dishonest, but not to any purpose, rather simply because the author shrinks from nothing in his desperation to be “readable and entertaining”. But what is in between is both entertaining and informing. It is much more about Langlands, one of the great modern mathematicians than about the book he is reviewing. My uncle had trouble carving the turkey. He complained about the sharpness of the knife. My grandma proceeded to rip the turkey apart with her own hands and throw a leg and breast on everyone's plate and said "There, that's Brooklyn style"
We here do get overly direct, up close and personal at times. Please, when we do, say whoa. Also, inscribe a cute bunny on your hearts for the New Year, and maybe into your blogrolls. 1. Future climate policy may involve action on such a large scale as to shift our economic path in a non-marginal fashion. Under such circumstances, conventional discounted cost-benefit analysis is inapplicable. Instead, analysis should proceed using a utility discount rate to compare the stream of social welfare with and without the climate policy. 2. The utility discount rate, δ, used for social decision-making should not be estimated based upon revealed individual impatience, but should reflect the risk of societal collapse. On this basis, the appropriate utility discount rate is smaller than the current HM Treasury rate of 1.5%, and although it is positive, δ is probably below 0.5% and possibly 0% to a first approximation. Note that this was the root of Eli's set to with one of the Aussie Tims. 3. Probabilistic forecasts of future growth rates should be used to determine certainty- equivalent shadow consumption discount rates. These will decline with time in the long run. They will also be different for different countries. 4. No specific schedule of declining discount rates for the UK is recommended here, because this should be based upon estimates of the distribution of future growth rates. Nevertheless, point 2 above suggests that the resulting schedule is likely to be lower from t=0 onwards than current HM Treasury guidance. For those of you in the US, reading the report has certain advantages over a football overdose. Goodnight, Mrs. Calabash, wherever you are. There has been considerable discussion about Lord Sir Nicholas Stern's choice of social discount rate. Rabett review pointed to Nordhaus' discussion paper, John Quiggen has gone after this issue, on his own blog and on Crooked Timber. Yohe at Yale also has something for yr consideration. Quiggen also has a comment on the long tail, an issue that will be of great interest to Annan and co-conspirator, or do I have that backwards? Anyhow, this brings us to the point of this post, did Stern simply pull his social discount rate out of the oriface below his vestigial tail? "...The social discount rate is a parameter that measures the importance of the welfare of future generations relative to the present. It is calculated in percent per year, like an interest rate, but refers to the discount in future "utility" or welfare, not future goods or dollars. A zero social discount rate means that future generations into the indefinite future are treated equally with present generations; a positive social discount rate means that the welfares of future generations are reduced or "discounted" compared to nearer generations." Philosophers and economists have conducted vigorous debates about how to apply social discount rates in areas as diverse as economic growth, climate change, energy policy, nuclear waste, major infrastructure programs such as levees, and reparations for slavery." Stern EXPLICITLY states in several places that it would be unethical to value future generations more than the current one. Indeed, the second chapter is entitled Economics, Ethics and Climate Change and there is a technical annex which discusses how this effects the social discount rate. The breadth, magnitude and nature of impacts imply that several ethical perspectives, such as those focusing on welfare, equity and justice, freedoms and rights, are relevant. Most of these perspectives imply that the outcomes of climate-change policy are to be understood in terms of impacts on consumption, health, education and the environment over time but different ethical perspectives may point to different policy recommendations. Questions of intra- and inter-generational equity are central. Climate change will have serious impacts within the lifetime of most of those alive today. Future generations will be even more strongly affected, yet they lack representation in present-day decisions. Standard externality and cost-benefit approaches have their usefulness for analysing climate change, but, as they are methods focused on evaluating marginal changes, and generally abstract from dynamics and risk, they can only be starting points for further work. Standard treatments of discounting are valuable for analysing marginal projects but are inappropriate for non-marginal comparisons of paths; the approach to discounting must meet the challenge of assessing and comparing paths that have very different trajectories and involve very long-term and large inter-generational impacts. We must go back to the first principles from which the standard marginal results are derived. Dennis Avery and Fred Singer have a new book out "Unstoppable Global Warming: Every 1500 Years" and Avery is on book tour. David Archer attended Avery's talk last week at the Heartland Institute which is "a nonprofit organization devoted to discovering and promoting free-market solutions to social and economic problems." A precis of the book's argument can be found at the National Center for Policy Analysis, whose "mission is to seek innovative private-sector solutions to public policy problems. By using innovative and unique approaches to these problems, the NCPA encourages individual rights, free enterprise and self-government." You might see a pattern here if you were not such a trusting bunny, but it does not seem that science plays much of a role. Since the scientists have more credibility, the denialists are trying to drive them out of the public area before they gain more traction. This is going on at Eli's favorite blogs, (look at the posts between Nov 15 and 21) but you have to ask yourself, why there, why this, why now. There are at a minimum two topics here. The first is a scientific one, are there 1500 year D-O cycles in the Holocene, or at least the recent Holocene, which for arbitrary purposes we might take as recorded history. If there are, how much are they influencing current climate change. It will be interesting to hear the tutt tutters comments on this piece of work especially in view of their objections to the shocking "political" statements of such as Paul Cruitzen and Al Gore on climate change. Energy & Environment is simply a newsletter reporting on Congressional actions on those issues. It is read by people in the associated industries and by politicians concerned about those issues. For the most part they don't read blorgs or blogs. Perhaps the Real Climate gang should ask to appear. It is diving. If you look at the linear regression fit, there has never been a year with a lower sea ice extent that 2006, and the deviation from the linear fit is extraordinary compared to the satellite record from the last 28 years. This should be watched closely next year and the year after. If the curve keeps diving well below the regression line we have entered a new regime for arctic climate. Axiom 1: The set of deers in the woods is not empty. Axiom 2: If there exists a deer in the woods, then there exists a deer in the cage. Procedure: If P is a theorem, and if the following is holds:"P implies Q", then Q is a theorem. Theorem 1: There exists a deer in the cage. We construct a semi-permeable membrane which lets everything but deers pass through. This we drag through the woods. Ethon flew in from Colorado on his way to Mt. Caucuasus for the Thanksgiving holiday, and while he lay over at Dulles we had a little chat of the latest faux controversy over at the place by the mountains. Seems that RPJr. is upset, very upset about the misrepresentation of science in policy, but Fred Singer and Pat Michaels need not fear that their perambulations about the facts will be discussed. We must pay due attention to the dire cases that worry RP in his atelier. Of course you knew there would be a slam at Donald Kennedy, the editor of Science, and indeed we are not to be disappointed. Right up there as a link to a terrible example is "On Donald Kennedy in Science, Again"
We know with confidence what has made the Gulf and other oceans warmer than they had been before: the emission of carbon dioxide and other greenhouse gases from human industrial activity, to which the United States has been a major contributor. That's a worldwide event, affecting all oceans. When Katrina hit the shore at an upgraded intensity, it encountered a wetland whose abuse had reduced its capacity to buffer the storm, and some defective levees gave way. Not only is the New Orleans damage not an act of God; it shouldn't even be called a "natural" disaster. These terms are excuses we use to let ourselves off the hook. In this week’s Science magazine editor Donald Kennedy opines that “Not only is the New Orleans damage not an act of God; it shouldn’t even be called a “natural” disaster.” Could it be that he sees the significance of millions of people and trillions of dollars of property in locations exposed to repeated strikes from catastrophic storms? Unfortunately, not at all. I suppose one could make the convoluted case that Prof. Kennedy is [just a bad writer/only talking about statistics/dumbing-down the science/anticipating inevitable future research results] and didn’t really mean to link Katrina’s damage (or Katrina) with global warming. But he did, clearly. Misrepresentation by omission is a very useful technique of course. Contemporary science is making it difficult to sustain such distinctions, and perhaps it can do something to clarify matters. As Katrina and two other hurricanes crossed the warm Gulf of Mexico, we watched them gain dramatically in strength. Papers by Kerry Emanuel in Nature and by Peter Webster in this journal during the past year have shown that the average intensity of hurricanes has increased during the past 30 years as the oceans have gained heat from global warming. Emanuel's Web site at the Massachusetts Institute of Technology (http://wind.mit.edu/~emanuel/holem/holem.html) explains the thermodynamic aspects of the relationship. The winds around the low-pressure center (the eye of the hurricane) travel across the warm surface water in a circular pattern, picking up energy. As water molecules evaporate from the surface, they contribute their energy to the storm column as they condense to form droplets, becoming sensible heat. About a third of that energy powers the hurricane's wind engine. One interesting comment by Dr. Karoly in the second news clip is that he said in the interview that the heat island effect is a “much much smaller effect than the observed warming we have seen over the last hundred years”. Since the urban heat island effect typically results in several degrees Celsius of higher temperature than surrounding rural areas, while the global average surface temperature increase over the last hundred years is in the fraction of degrees Celsius, he is incorrect in his claim. Your statement on Karoly can be found on many sceptics site in different forms. I am sure you could do a bit better. Karoly obviously talks about the impact UHI has or might have on corrected global networks. So “the several degrees” has absolutely nothing to do with it. Georg - My reply is for you listen to the statement on the video interview by Dr. Karoly. If he meant the role of the UHI on the global averaged trends, he certainly did not say that. What the listeners heard was an incorrect report on this aspect of climate science. Roger you give me 10 hours of tapes of you speaking about climate, dear hunting and car maintenance and I make you in 30 seconds summary appear as a complete moron. I insist it’s absolutely clear from the Karoly interview that he is speaking about UHI impact in global warming detection. I insist your presentation of the statements of Dr Karoly is dishonest and it’s not up to Dr Karoly to clarify his statement but to you to correct your website. Thank you for the invitation to correct the information in your blog. In the second news clip, when I said in the interview that the heat island effect is a “much smaller effect than the observed warming we have seen over the last hundred years”, I was indeed referring to the global average temperature variations. That would have been obvious if the previous sentence from my interview had been broadcast. The editing for the broadcast omitted that sentence. Pielke Sr., R.A., C. Davey, D. Niyogi, K. Hubbard, X. Lin, M. Cai, Y.-K. Lim, H. Li, J. Nielsen-Gammon, K. Gallo, R. Hale, J. Angel, R. Mahmood, S. Foster, J. Steinweg-Woods, R. Boyles , S. Fall, R.T. McNider, and P. Blanken, 2006: Unresolved issues with the assessment of multi-decadal global land surface temperature trends. J. Geophys. Research, submitted. I hope the paper listed above encourages you to explore the set of issues that we raise. where Clarissa explains it all. Suitable responses are solicited. They must be publishable on a family blog. Samuel Webber: When I was a child, people clapped at the end of movies -- we knew that the filmmakers wouldn't actually hear us, but we showed our appreciation nonetheless. Over the years, it seems that tradition has died out. I don't think I've heard anyone clap at the end of a movie for twenty-odd years. Until, that is, this afternoon. The entire audience clapped at the end of "An Inconvenient Truth". but praise is boring and rather letting our valued readers have to suffer through many positive reviews let us decend into Global Warming Skeptic Bingo territory. Gentle Readers: The editors at Rabett Run are pleased to offer featured publication in the 191,498th ranked blog, to the BEST negative review of "An Inconvenient Truth" One that combines all the arguments that we have come to love and value from our denialist friends in a way that brings smiles to everyone. daddydaddy "daddydaddy" : There are natural cycles and the sun is proven to be at a hotter stage at this time. Environmental propaganda is being used to hand over our National Parks to the United Nations. Think of the Democrats and Republicans as good cops and bad cops working for the Global Bankers -- their Masters. The Federal Reserve is a privately owned, International Banking Cartel. We need to investigate the effect of the HAARP program based in Alaska on our ozone. Don't be fooled. Our government is holding secret meetings and signing paperwork to form the North American Union. They seek to combine Canada, Mexico and the United States. Say goodbye to the Dollar and hello to the Amero! Remind anyone of the Euro? Wake up folks. Our media is owned by five companies and they are not watchdogs of Freedom. They are the lapdogs of the Global Elite. Turn your eyes away from the truth and you doom your children to a future Police State, chip implants and tyranny from a remote, Global Government. Stop and think a moment. We are being enslaved through incrementalism. We can't even tie a piece of string to a stick and dip it into the ocean without a license. I recently went through a road block at 10am during the work week where they were arresting people and towing vehicles. Their purpose to stop me? To see my Driver's License. "YOUR PAPERS PLEASE!" Investigate the claims of this DVD and you'll see for the most part is is bunk! Buy and watch Aaron Russo's "America Freedom to Fascism" if you really want a valid cause to fight for. Buy and watch "Terrorstorm" by Alex Jones for even further clarity. Our Liberty and our children's Liberty is at stake. John R. Linnell Al Gore's thirty-seventh attempt to reinvent himself, become relevent in today's culture and climb into the 2008 presidential race is, as you can see from the reviews here, being wildly received by The Left and all of their associated minions. While the movie may be "incovenient", it has little relationship to the truth. Inspite of predictions of global cooling many years ago from these same people, they have jumped off that horse and climbed on another. It is true that the global average surface temperature of the planet incread by 0.6 degrees C. over the course of the 20th century. However if fossil fuel burning is responsible for this tiny increase, why does half of the "warm up" occur between 1900 and 1945. Why isn't there significant warming in the second half of the century when so much more fuel was being burned? Hmmmmm? "The Ice Caps are melting!! Sea levels will rise!!" Really? Such drivel shows a real lack of scientific understanding. Ice caps are after all, floating ice. Not a land mass. To see how water levels will rise try this little scientific experiment. Take a bowl. Fill it half full of water. Add a lot of ice cubes or a block of ice. Mark the level of the water once that is done. Let it melt. Note the water level has not risen because the ice melted. Duh!! The predictions of global warming are based on computer models done by some scientists who have made a great living out of scaring the bejesus out of the rest of us. Those are the same type of models who told us in the 70's to prepare for global cooling and the return of the Ice Age. Just as figures don't lie and liars can figure, a computer model can be made to produce any desired outcome that the programmer wants. And the Gore crowd wants doom, gloom and disaster. Coming right up!! There is no question that the Gore movie is an impressive piece of propoganda. If you accept what he says at face value you will become as hopelessly fearful as many of the reviewers on here. However, Orson Wells was similarly successful for a brief period of time with a Mercury Theater radio broadcast concerning a Martian invasion. He scared a lot of people who thought they were listening to the real thing. His radio broadcast had about as much scientific basis as Gore's doomsday predictions about global warming. Huge Viking Al Gore is at it again with his liberal environmentalist whacko issues of the so-called global warming. We cannot say it's the truth, and it should only be based on theory. Global warming is only used by liberals as a scare tactic. Al Gore spent too much time growing up as a city slicker in Washington when his segregationalist daddy, Al Sr, was in the Senate. Gore only relies on data released by these so-called environmentalists. If you really want to know better about the environment, it is not CO2 emissions that causes global warming. While CO2 is the heaviest gas in our atmosphere, all human and animal life exhale CO2 which is a beneficial gas that vegetation thrives on such as trees and plants that take in the CO2 and convert it back to oxygen. Also, the "warming" we are experiencing is due to the fact that climate changes occur in cycles. There have been record highs over one hundred years ago as well as record lows in between. The last few winters we've experienced were at record lows, particularly in upstate New York where temperatures dipped down to a fridgid -35ºF. Now what does that explain? In any part of the world climate does not remain stable where one would experience the same temperatures over and over again at a certain time of year since there are changes occurring all the time, it alternates. Volcanic eruptions would be a very big problem since a single volcano can release nearly ten times more toxic gases than all manmade emissions throughout the world combined. Third world nations account for environmental problems where there are virtually no strict codes on hazardous waste disposal. Hence, disease is rampant in these nations that have very few or no sanitation facilities by dumping solid waste directly into drinking water or into the ocean where deep water coral reefs thrive. Yes, there are deep water reefs in many parts of the world that encapsulate CO2 and other gases. Pollutants dumped into the sea are killing these reefs, thus releasing these gases into the atmosphere. True environmentalists are usually those employed by the logging industry that have done intense studies, maintaining nurseries, and replacing each hewned tree with two to four saplings. Younger trees, particularly saplings, thrive better on CO2 and have the tendency to release more oxygen than older specimens. We can only say that Al Gore has a lot of learning to do. He's just jumping to conclusions and listening to whatever data is available to him. This film would only be based on his opinions and not on fact. G. YoungerHow inconvenient that news this week reports that global warming on a scale we can't even imagine happened millions of years ago. Evidence of tropical temps in polar seabeds says that that this isn't the first time we have had global climate change. Al Gore is convincing and passionate. To bad he only used half the facts he needs for a complete presentation. In the 1970's there was a big uproar about global COOLING, what happened to the science behind that? Just because we get a well made argument, and a terrific film made, does not make it true. That said we do need to learn to live lightly on our planet. We will effect the environment from living here, but can we minimize our effect? A noble and worthwhile cause. If you want to believe that the byproducts of human occupation of this planet is evil, this presentation is for you. If you believe that we live in an evolving ecosystem, and that evolution changes the makeup of our world, you may not get much from this film. A logical environmentalist viewpoint. Dr. Serizawa If Earth's global warming is caused by increased CO2 emissions, then why are the icecaps of Mars disappearing? Solar astronomers know why the earth is warming. Gore is an idiot who flunked out of college. A. Gillette:I certainly enjoyed this movie and I think it's worth seeing. But after some investigation, the reason I only give it 3 stars is for this little known scientific fact: Not only is Earth heating up, all of the other planets in the solar system are heating up as well, as are so are many other planets in the vicinity. If this is true, than our man made CO2 emissions aren't the major reason for the heating of the planet. The question would be "What is?". 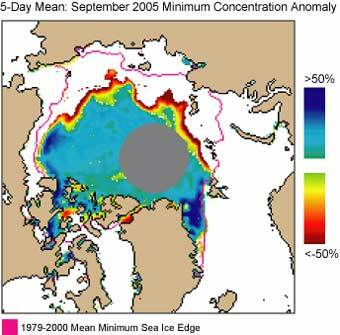 It is not helpful to deny the glacial melting, as is very obvious by satellite photos. Everyone should also be aware that "they" are about to make you pay a national "global warming tax." I find that interesting, don't you? But still you should see the movie and make up your own mind. Even if C02 emissions aren't the most prominent cause for global warming, that doesn't mean we can keep polluting the air we breathe. Raymond E. Pellerin "Real American" ("A Real American" Watching this kind of junk science and half truths makes one think of Hitler's so called "master race". Bending facts and history to push your political views is something Hitler and Gore have in common for sure. This movie also makes it clear just why Al Gore lost the 2000 election as this film is further proof he is a left wing extremist who plays on slow witted peoples fears. You would have to be confused by punching holes in paper to buy any of this nonsense. Case in point Gore talks about how many cubic tons of ice are melting off the edge of one particular glacier. Not only is this purely anecdotal "evidence" of global warring it has been roundly discredited. Glaciers are always melting as they move south if they did not the Earth would be one giant ball of ice. The real "Inconvenient Truth" is that the glazieries are GROWING faster then they are melting. D. Lafleur "HemiDave"The 'facts' that Gore are dated, discredited and in some cases, downright fraudulent. Do your own research and you will see that this is the case. An overwhelming number of scientists that DO NOT have a federal grant or research dollars at risk do not agree with the conclusion of this film (I just can't force myself to call it a documentary...) Don't waste your time with this propaganda and attempt to get you to agree to even MORE taxes!! J. BiermanWhy, if this is such a dire time for global warming, would you have to pay to learn about it? Al Gore advocates a global tax for global warming, and you think that's going to help? One more thing to think about: When a volcano explodes, it releases more CO2 than all of our cars combined in a year. Do research, don't be blind. What can you say about someone like AL Gore who see natural cycles of the Earth that have been going on for millions of years and see a threat when at the same time he and his party are protecting the right of terrorists. This is junk science and playing on peoples fears. Go ahead and rent it along with your favorite Chicken Little story. It is intended for the same audience except for the fact the children understand child fiction when many adults don't. It's a big internet out there. KEVIN TRENBERTH reckons he is a marked man. He has argued that last year's devastating Atlantic hurricane season, which spawned hurricane Katrina, was linked to global warming. For the many politicians and minority of scientists who insist there is no evidence for any such link, Trenberth's views are unacceptable and some have called for him step down from an international panel studying climate change. "The attacks on me are clearly designed to get me fired or to resign," says Trenberth. The attacks fit a familiar pattern. Sceptics have also set their sights on scientists who have spoken out about the accelerating meltdown of the ice sheets in Greenland and Antarctica and the thawing of the planet's permafrost. Another sensitive area is the concern that existing models of ice sheets on Greenland and Antarctica massively underestimate future melting and consequent sea-level rise. "Our understanding of the dynamics of ice-sheet destruction has completely changed in the last five years," says Richard Alley of Penn State University, a lead author of the chapter on ice sheets who expects to find himself in the firing line over this issue. "We used to think it would take 10,000 years for melting to penetrate to the bottom of the ice sheet. But now we know it can take just 10 seconds," he says. An issue on which we have had a few dozen chosen words. "The skeptics who get vocal are vilified," Marc Morano, director of communications for the Senate Environment and Public Works Committee. "An echo chamber" where "the media and climate alarmists demonize climate skeptics." Marc Morano, director of communications for the Senate Environment and Public Works Committee. How many climate scientists are there mommy? If we look at foreign members we get a total of 19340, which in the spirit of Iraq Body Count we can take as a lower limit, but certainly within a factor of 2. As some of you may remember and fewer care, Tim Ball has sued Dan Johnson for telling the truth about him in print. DeSmog Blog has many of the details as well as various writs and replys. Ear tip to Richard Littlemore who has been on top of this issue. Among the various '''embellishments''' to Ball's resume are claims that he was the first Canadian Ph.D. in climatology, that he was Professor of Climatology at U Winnipeg for 22, 24, 26, 26, 32 or maybe 64 years and that he has lots and lots of scientific publications (he has 4, as far as anyone and ISI can tell). Well, you ask, why hop along well trod paths? Interestingly, since Tim has folded his Potemkin Village Friends Foes of Science organization, and taken up with Tom Harris in the new development, National Resources Stewardship Project. UPDATE: The wordrabett unit in our lab has upgraded the beta to 1.1 substituting reprehensible for rapacious. Dr. Ball is a renowned environmental consultant and former professor of climatology at the University of Winnipeg. Dr. Ball has served on many local and national committees and as Chair of Provincial boards on water management, environmental issues and sustainable development. Dr. Ball has given over 600 public talks over the last decade on science and the environment. He is the co-author of the book Eighteenth Century Naturalists of Hudson Bay (2004 - McGill/Queens University Press) with Dr. Stuart Houston, one of the World's leading authorities on arctic birds. Well, we could argue about the extensive......or just laugh a lot. The former wonderful things about Tim Ball have gone missing, but in those four papers he got a lot of things done. impact studies on flooding of aboriginal lands in Manitoba. Two major areas of real expertise per paper. Good work if you can get it and pity no one else noticed as the number of cites is between zero and zero (Dear Ball lawyers: this is exaggeration for effect, but the number was orders of magnitude less than 10). Ball is a fine example of the molehills to reams of paper ability of academics. As one of those who just does the damn stuff, this tendency is somewhere between amusing and enraging depending on whether it is my department or yours. Johnson's lawyers should get a screen shot of Balls page at the Needy Rapacious Scientists and Publicists society, as it proves just about all of Dan's contentions. Every earlier description of Ball that Ball had a hand in contained one or more of the claims that Johnson called him on. This one? Sadly No? but the GHG contribution is large. UPDATE: What Rabett Labs originally put up for Andrew Bolt correction has metastisized a bit (S. RAHMSTORF ALERT: the last link has spread to Shaviv and Verzier territory) the bunny will hop back into the Schreibetorium and add a few details, most of which come from the on-line Stratospheric Ozone Textbook, which REALLY has all you want to know about stratospheric ozone (this is the stuff up there, not teh stuff down here which leads to ozone alerts). The second effect is more complicated. Greenhouse gases (CO2, O3, CFC) absorb infra-red radiation from the surface of the Earth and trap the heat in the troposphere. If this absorption is really strong, the greenhouse gas blocks most of the outgoing infra-red radiation close to the Earth's surface. This means that only a small amount of outgoing infra-red radiation reaches carbon dioxide in the upper troposphere and the lower stratosphere. On the other hand, carbon dioxide emits heat radiation, which is lost from the stratosphere into space. In the stratosphere, this emission of heat becomes larger than the energy received from below by absorption and, as a result, there is a net energy loss from the stratosphere and a resulting cooling. Observant numerates might notice that the two figures are "not in agreement"TM . The reconstruction immediately above was one of a series of very similar reconstruction published by the same group, the latest of which appeared in GRL 31 (2004) L13205. 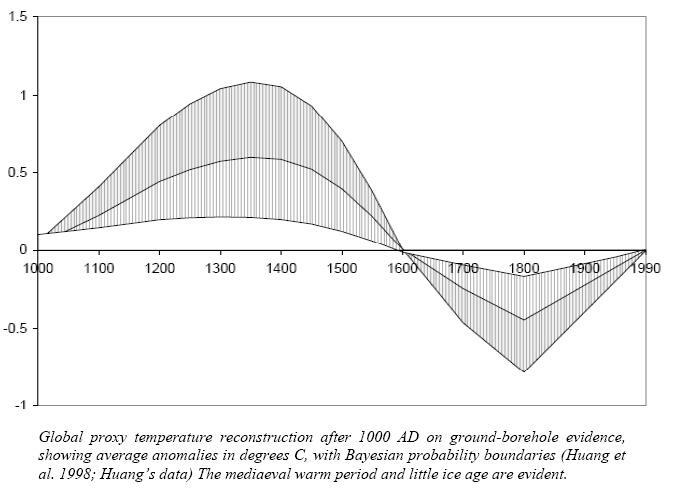 These surface temperature histroies shown in Figure 2 (ed: the first figure in this post) indicate a long-term warming from the colder conditions of the last glacial epoch of the late Pleistocene, peaking at temperatures above present-day in the interval 4000-8000 years ago. 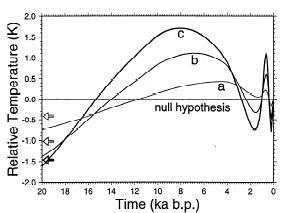 For several thousand years in the early Holocene the temperature averaged some 0.2 - 0.6 K above present day. Following this warm interval a cooling ensued in which the temperature dropped to near or below present day, reaching a minimum in the interval 1,300-1600 years before present. 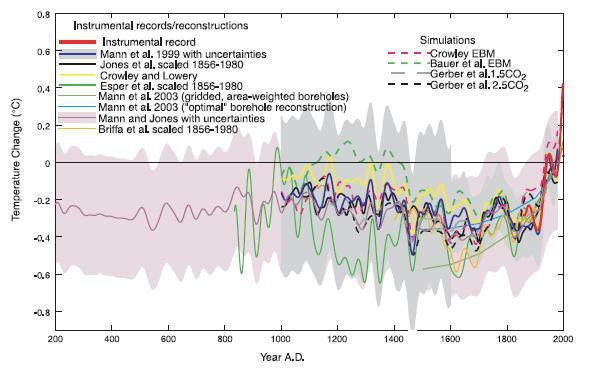 A warming follwed, yielding temperatures that averaged 0.1-0.5 K above present day in the interval 500-1000 years ago. 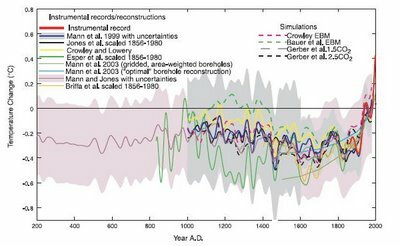 From the peak of this warm period some 700-800 years ago, the temperature declined until about 200 years ago, reaching a minimum of about 0.2 to 0.7 K below present day, at which time a warming commenced that continues to the present. 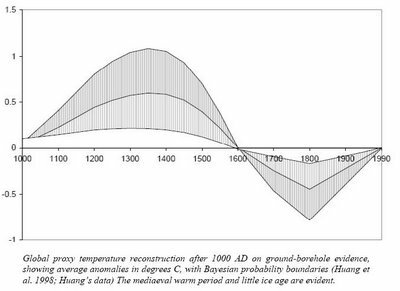 Their published 1500-2000 borehole temperature reconstructions are absolutely incompatible with this scenerio, what is more, they are also in disagreement with the various bent, broken or distorted hockey sticks. Mann, Rutherford, Bradley, Hughes and Keimeg took this on in 2003, (for those without access see comments in EOS I and EOS II from which we got this mother of all spaghetti graphs.) The Huang, Pollack reconstruction lies below almost all the others earlier that 1800). MRBHK pointed out that the borehole data could be falsified by landcover changes, e.g., snow, soil humidity, etc. and reconciled the borehole data with the other proxy reconstructions. (RTFR if you really want to know). At a minimum one of the two thoughts in Huang and Pollacks minds is wrong, and maybe both.